Osteolysis is a condition wherein bone breaks down, undergoes resorption, and dissolves into a viscous solution. Our research focuses on developing a minimally-invasive surgical workstation to clean the osteolytic lesions in the hip due to wear particles from the polyethylene lines of total hip arthroplasties. We are developing a robotically-controlled dextrous manipulator (snake-like robot) and the appropriate tools and active cannulae to clean the cavity behind the acetabular cup. 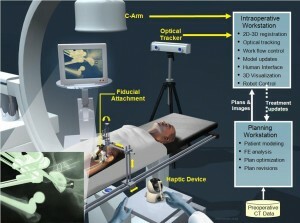 The dextrous manipulator will be one tool in a surgical workstation for the diagnosis, planning and real-time intraoperative treatment of the lesions. The intraoperative protocol includes real-time monitoring and navigation to provide feedback and update the preoperative plan.